This volume has taken a lifetime to research and produce. David has supplemented the text with plans, his own drawings, those of the late Malcolm Newton, historical documents and other research material. These were important mines providing the essential lime for furnaces in the Industrial Areas around Ironbridge. Transport was by tub boat and were some of the earliest canal system ever used. There are still remains of tunnels and inclines used for getting the lime to industrial heartland. 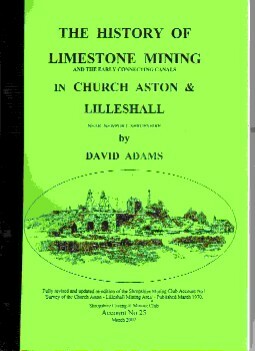 David also provides 4 walks which allows the reader the opportunity to visit the sites and see the hidden remains of Kiln, mineshafts and Quarries. The book contains two A3 fold out maps drawn by David who shows off his cartography skills. There are 123 black and white photos mainly from the authors own collection mainly taken in the early 1960's before quite a few of the buildings and remains were still intact and not destroyed new developments and roads.